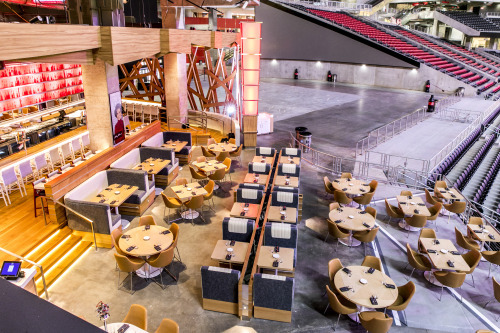 From the creators of Atlanta’s award winning TWO urban licks and dozens of critically acclaimed restaurants across the country, comes an entirely new dining experience for Mercedes-Benz Stadium. Molly B’s, named on behalf of Arthur Blank’s mother, is a contemporary, southern-style chophouse with a modern twist. Chef Michael Bertozzi has created a rotating menu that evokes southern-inspired delectable dishes such as freshly carved bone in prime rib, 6 cheese macaroni and cheese and house made glazed donuts. Molly B’s is open to the public for lunch most days of the week and offers a unique food and beverage experience for Atlanta Falcons and Atlanta United games.